Native to Northern Africa, Western Asia, and Europe. Introduced and naturalized in the United States. Potentially invasive. This is a 2′ to 4½′ tall, rarely taller, erect, biennial forb that rises on a single stem from a fleshy taproot. In its first year of growth this produces a rosette of basal leaves. In the second year it produces a hollow stalk that is branched, hairy, and ridged. 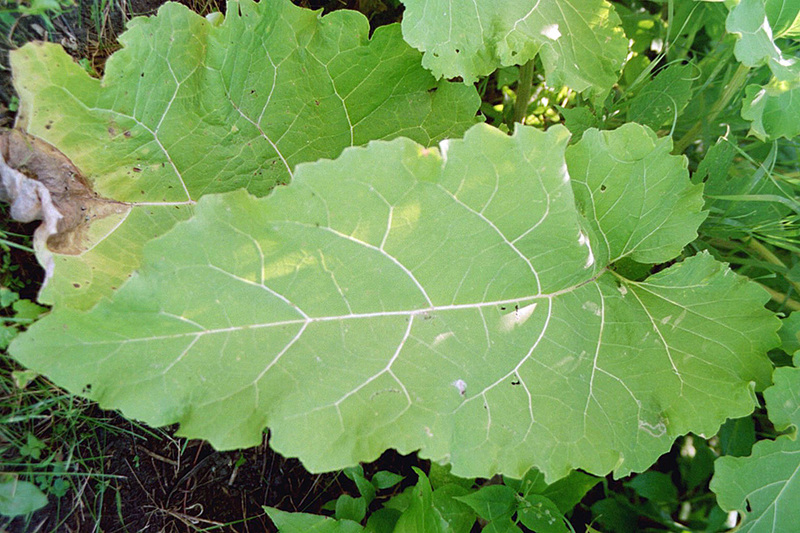 Basal leaves are large, heart shaped and indented at the base where they attach to long leaf stalks. They are 12″ to 24″ long and 6″ to 14″ wide. The leaf stalk is 6″ to 20″ long, hollow at least at the base, and not grooved. The upper surface is green with sparse short hairs. The lower surface is light green or gray-green, with a thin covering of matted, short, soft, woolly hairs. The leaf margins are wavy. By the time the flowers are fully open the basal leaves are usually withered. Stem leaves are much smaller, alternate, and egg-shaped, getting progressively smaller toward the top of the stem. They are nearly hairless on both the upper and lower surfaces. Flower heads appear in a clusters at the end of the stem and in the upper leaf axils. The clusters are crowded and densely packed. 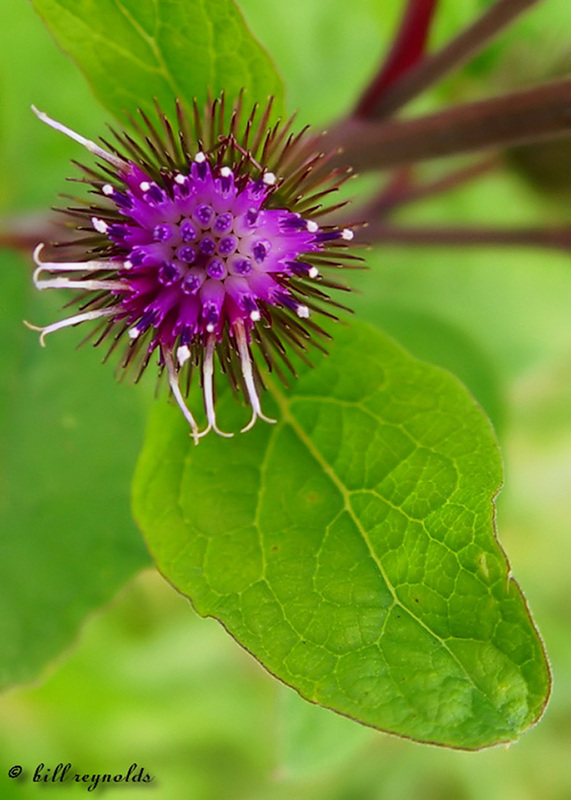 The flower heads have about 30 purple, pink, or, sometimes, white florets, are on short stalks or on no stalks at all. The whorl of overlapping bracts subtending the flower head is ½″ to 1″ in diameter and hairless. The bracts are hooked at the tip. 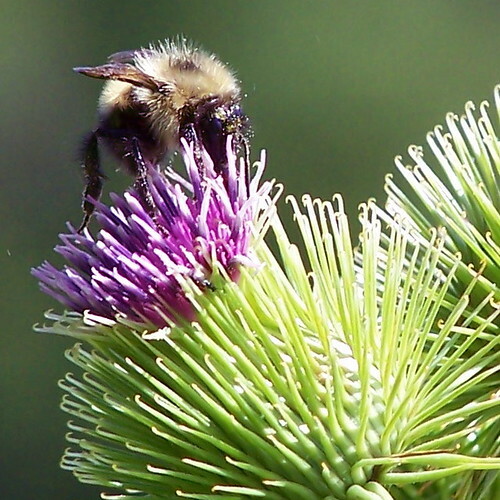 When dry the flower head becomes a bur resembling a thistle. 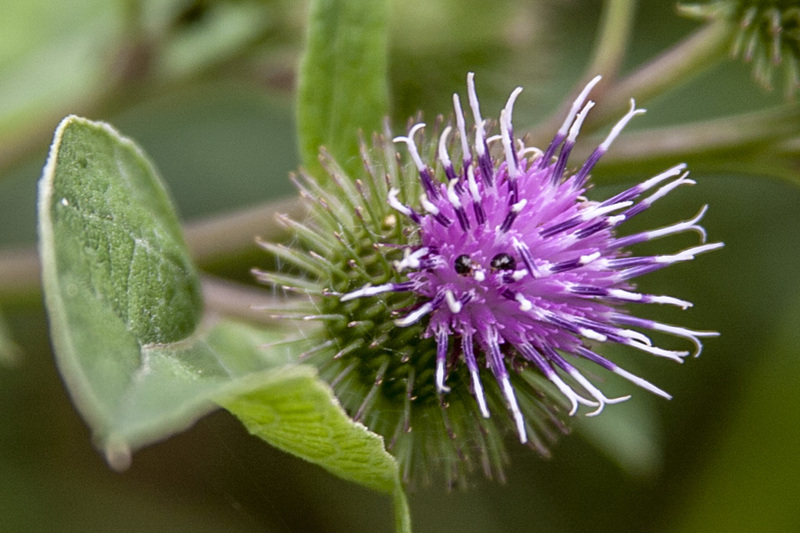 Thistles, however, do not have hooked bracts. 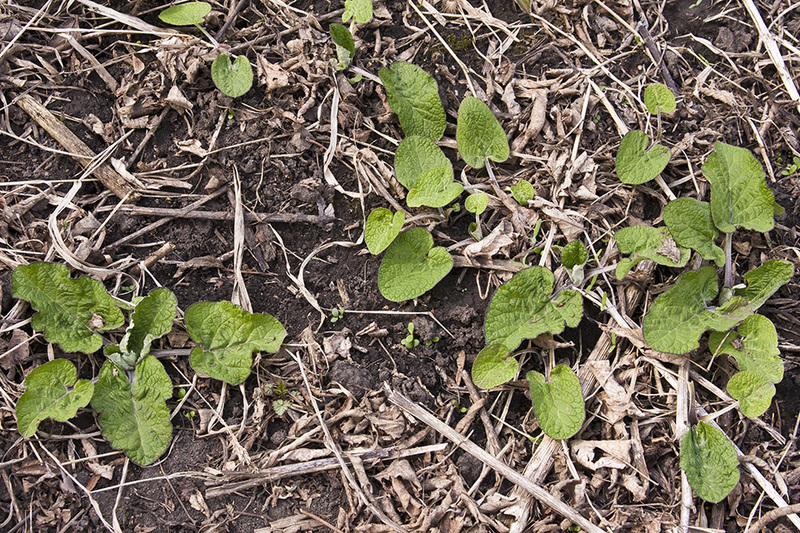 Woolly burdock (Arctium tomentosum) leaf margins are flat or only slightly wavy. 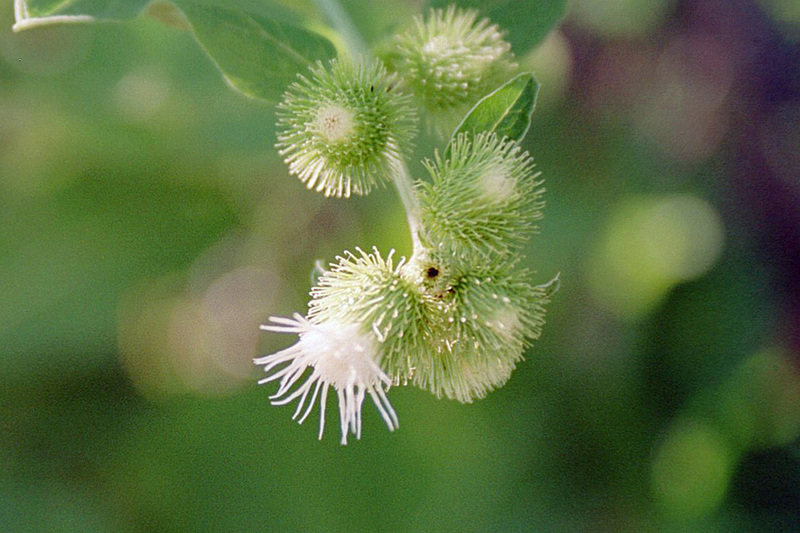 The flower heads are densely cobwebby. The inflorescence is a group of stalked flower heads with the outer ones on longer stalks, forming a flat-topped or convex cluster. 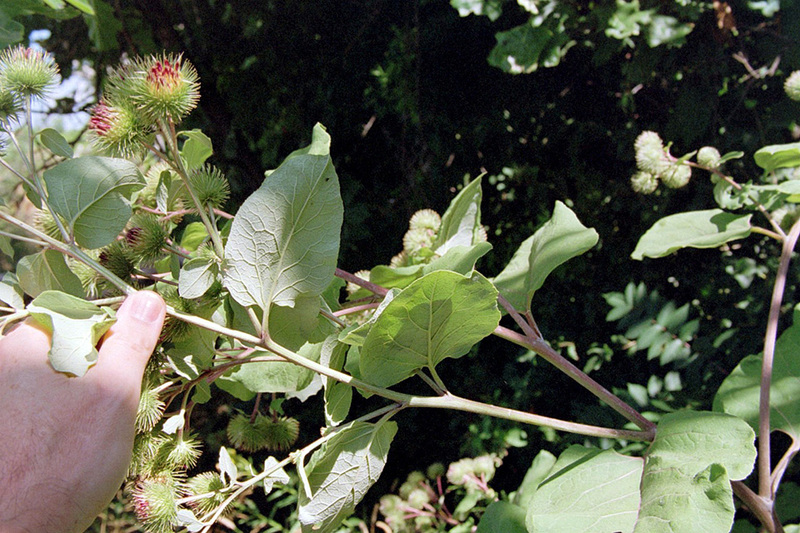 Great burdock (Arctium lappa) leaf stalks, including near the base of the plant, are mostly solid and are deeply grooved. The flower heads are on long stalks. The inflorescence is a group of long-stalked flower heads with the outer ones on longer stalks, forming a flat-topped or convex cluster. The heads are larger, 1″ to 1½″ in diameter. Cardueae is a synonym of the tribe name. Cynareae was published first and has precedence. Nevertheless, most sources use the name Cardueae for the tribe. 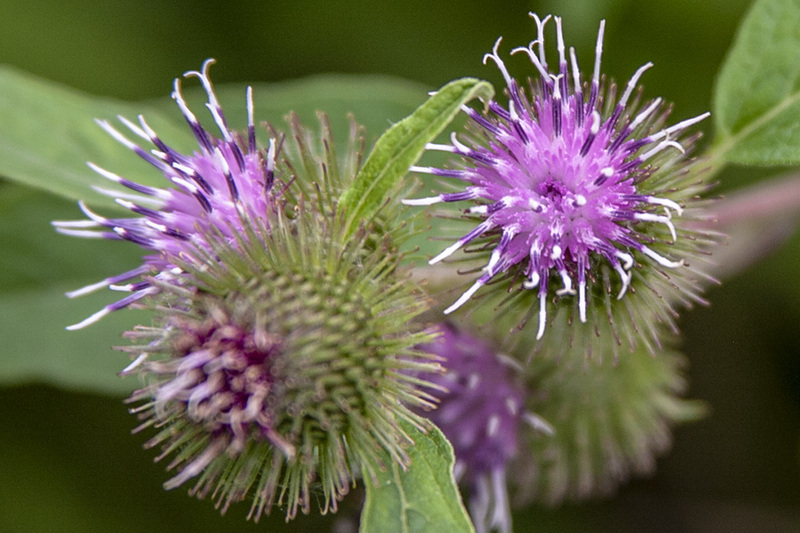 Introduced biennial to short-lived perennial similar to Arctium lappa but perhaps standing upwards of just over 1 m tall, with basal leaves up to 20 cm long, flowering heads 15-30 mm wide and arranged in panicles of spikes. 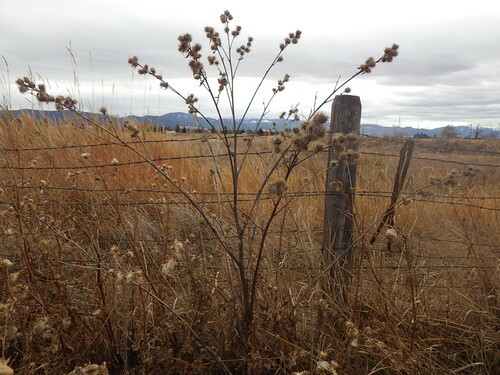 Arctium species do well in sites that are frequently disturbed. Photos used under protection of the "fair use" section (107) of the U.S. copyright act of 1976. http://www.youtube.com/watch? 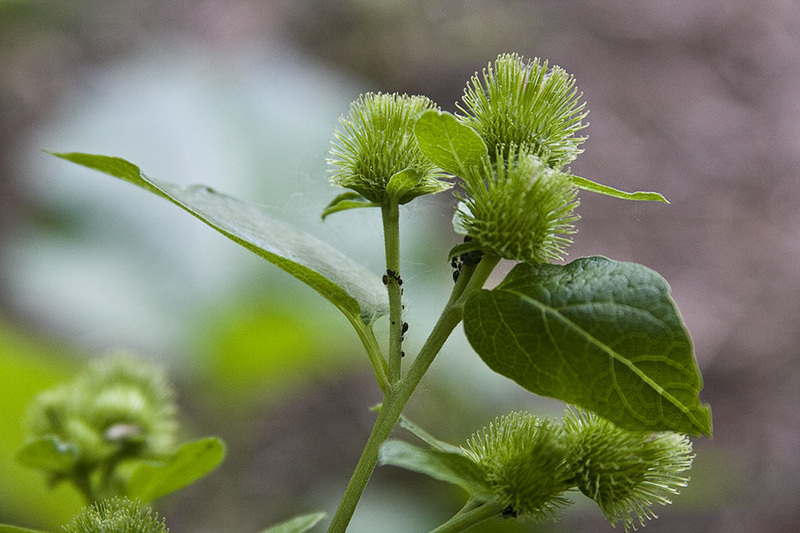 Lesser burdock (Bardane, Common burdock, Lesser burrdock). 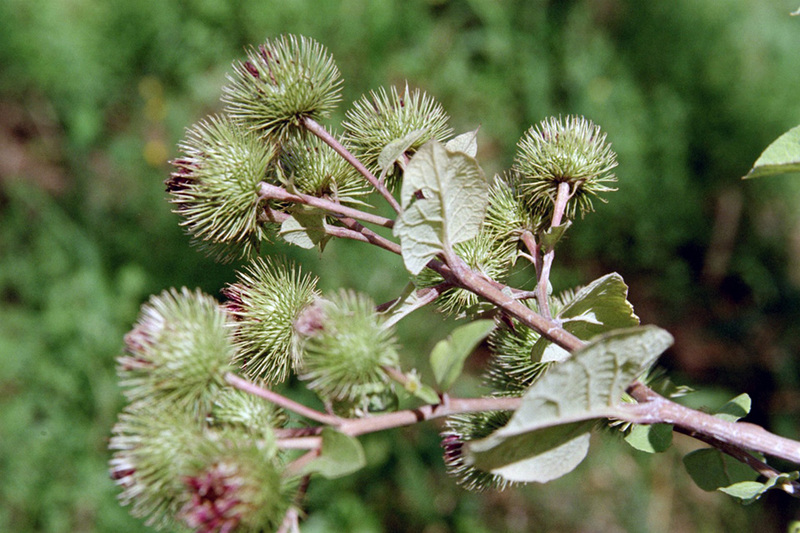 De gewone klit (Arctium minus) is een vaste plant, die tot de composietenfamilie (Asteraceae) behoort.